"The Sabbath is a holy day in which to do worthy and holy things. Abstinence from work and recreation is important, but insufficient. The Sabbath calls for constructive thoughts and acts, and if one merely lounges about doing nothing on the Sabbath, he is breaking it. To observe it, one will be on his knees in prayer, preparing lessons, studying the gospel, meditating, visiting the ill and distressed, writing letters to missionaries, taking a nap, reading wholesome material, and attending all the meetings of that day at which he is expected. 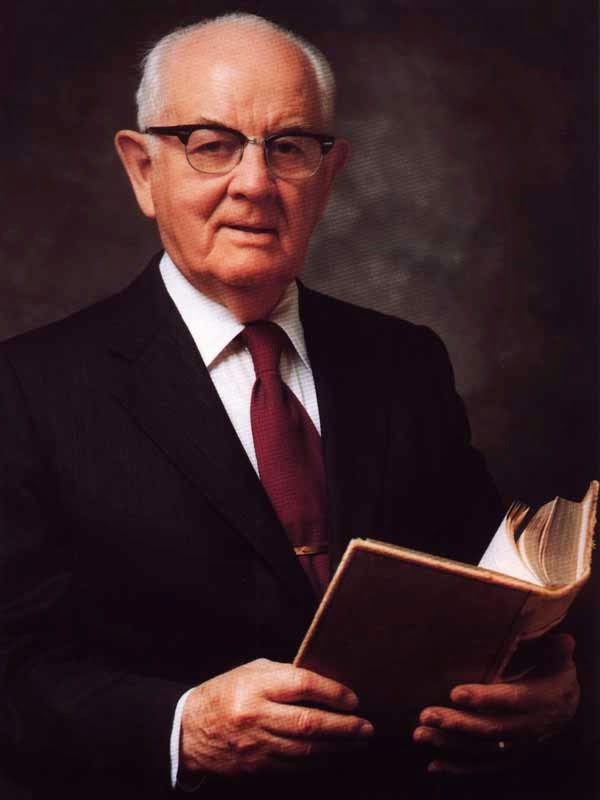 "One good but mistaken man I know claimed he could get more out of a good book on Sunday than he could get in attending church services, saying that the sermons were hardly up to his standards. 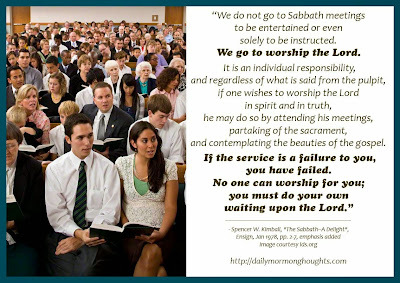 But we do not go to Sabbath meetings to be entertained or even solely to be instructed. We go to worship the Lord. It is an individual responsibility, and regardless of what is said from the pulpit, if one wishes to worship the Lord in spirit and in truth, he may do so by attending his meetings, partaking of the sacrament, and contemplating the beauties of the gospel. If the service is a failure to you, you have failed. No one can worship for you; you must do your own waiting upon the Lord." I think that a sign of a true disciple of Christ is that he or she appreciates the significance of the Sabbath Day and is naturally eager to "do worthy and holy things" including "constructive thoughts and acts." Many are pleased to note that President Kimball's list of appropriate activities includes "taking a nap." We would do well to consider the other items he lists, and to add our own insights. But the second paragraph is even more significant to me. It relates to our personal worship experience, and how we draw closer to God through Church meetings. President Kimball instructs that worship is a personal responsibility, but that it occurs best within the constraints the Lord has defined.